It was finished last weekend. 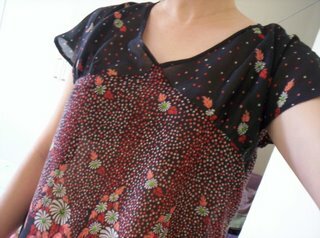 I made this top for "Wardrobe Refashion 06" as well. It was done in 70's vintage fabrice, pattern from one of my Japanese pattern book called "Female" Summer 2005 issue. It's easy to make and I love the flower print on the fabric. Eventhough the colour is dark and very Autumn, and still I like it. It's very light to wear and easy to match as well.